Fables are a completely different kind of story than fairy tales or saint stories. They are much shorter and without many details. They are awakening to the children and dissatisfying. They call on more of the intellect than the imagination, and this is right where the 2nd grader sits – at a junction between being more aware and analytical and being dreamy and filled with imagination. An 8 year old can be filled with opinions. They love vanilla ice cream and hate strawberry ice cream. They play with opposites and behave this way too. Some days they are saintly, and other days they act like animals! Fables speak to this dichotomy. The stories show our virtues and failings personified in the animal kingdom. They tell of very naughty behaviors and already our young children respond with, “That’s not nice! I don’t like that” after hearing that the Raven let his two oldest children fall into the ocean. However his youngest child was carried safely across the open seas after telling the truth. The children hold a feeling or image within themselves after hearing a fable, and the truth lives in them, so that it develops into a morality or code of behavior. It helps to soften their strong opinions and guide their inner development. Before we dove into talking about animals, we spent the first two days of this block talking about humans and our qualities. This is a precursor to the Human and Animal Blocks that the 4th graders are experiencing this year. Specifically we are talking about what our hands and feet can do. 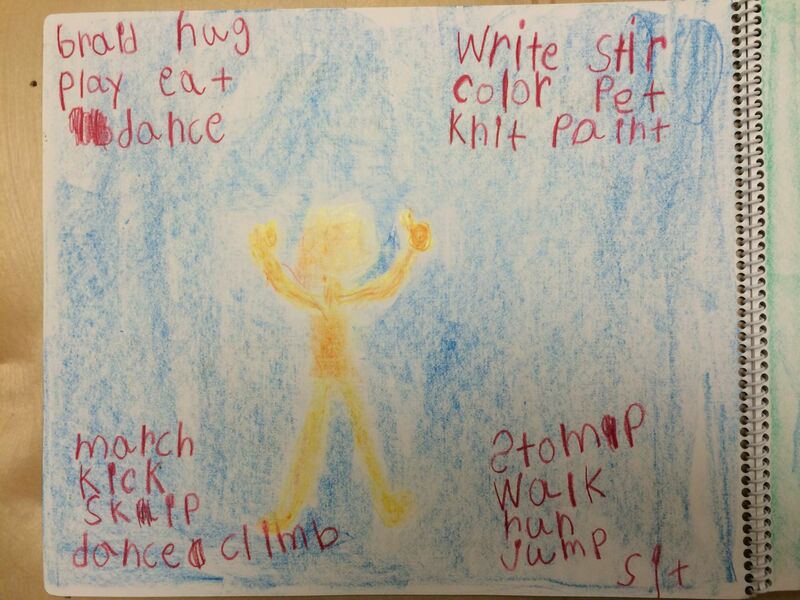 Run, walk, clap, snap, wave, write, draw, paint, tiptoe, etc. We drew a beautiful picture of a human being and wrote some of these doing words (verbs) around the person. The next day we visited the kitchen in the church, looked out at the garden, talked about Peace Park and then our classroom with the same question in mind. What do our hands do in each of these places? We drew a picture of each place and wrote some of these words. On Thursday, we began talking about what animals do with their legs and we brought in the characters from our fables – lions, mice, foxes and storks. I asked, “What can these animals do better than humans?” The class came up with words like hunt, scurry, sniff, rip, fish, etc. 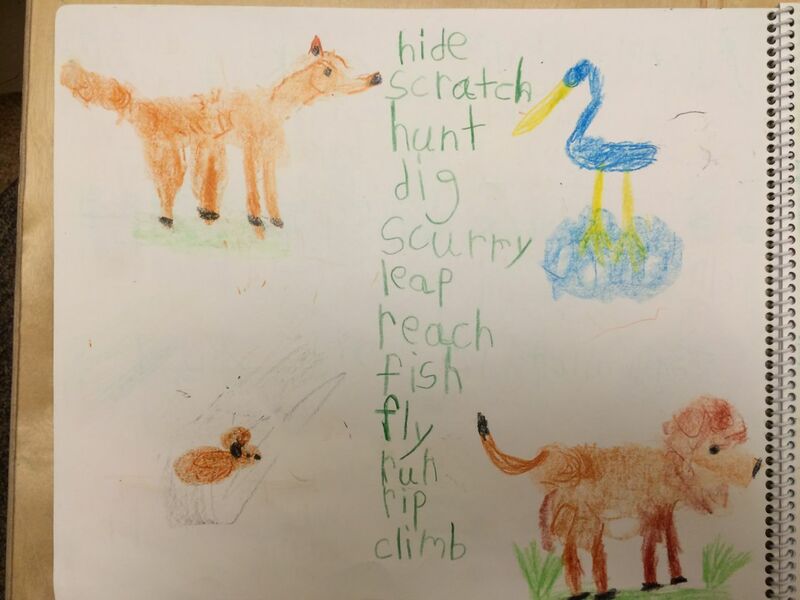 We drew these four animals and wrote some of these doing words around them. What do our hands and feet do? What do animals do better than humans? On Friday, Eva came in for me and the class painted complementary colors yellow and purple. It sounded like all had a great time outdoors in the warmer weather. During Reading Time this week, I introduced the first of our consonant blends to the 1st graders – which was great review for 2nd grade. We learned the th, sh, ph, wh, ch sounds and played a game to try to make words. In circle, we began acting out the fable of the Boy who cried Wolf. The children love it! And we continue to work on the Winter Wind song on our flutes. In the second week of this block, we had five complete days in the classroom and my – did we progress this week. I saw the fruits of months of work. We are at a point in the year where everyone is deep into our routines and procedures and can easily work quietly and work hard. Handwriting is improving. The children’s capacity to work hard and work long is increasing, as well as their capacity to take care of themselves, wait patiently for my help, and remain quiet. Skills are coming around too! It’s an exciting time for teachers in the classroom! 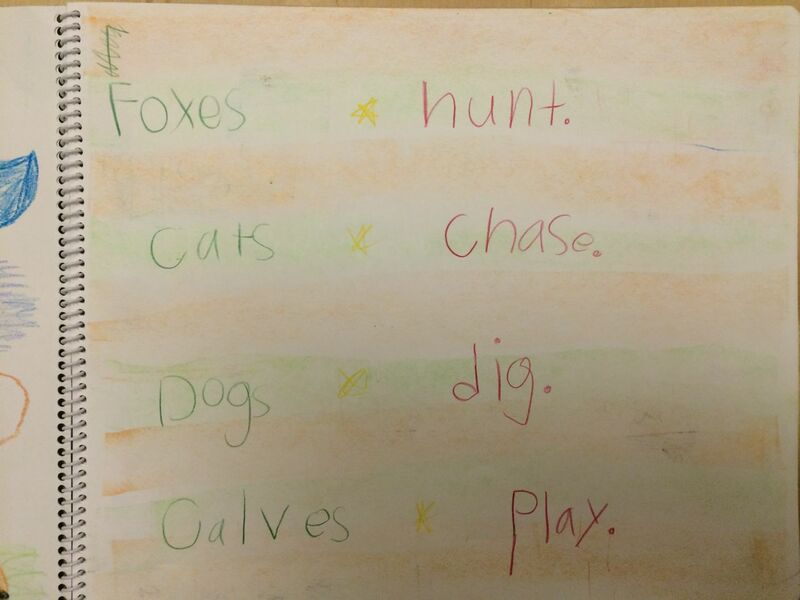 On Monday, we reviewed the animals that we had talked about the previous week and remembered the actions words that answered our question, “What can these animals do better than humans?” We took these nouns and verbs and made simple sentences such as: Lions rip. Storks fly. Foxes hunt. First graders copied these sentences from the board. Then the second graders came up with their own sentences and wrote them. This was our first big step into writing. Until now, second graders have only written in conjunction with me and then copied these sentences from the board. Now they made the leap to writing on their own. They sounded out the words and wrote them on scrap paper. Then I edited their writing and they wrote a final copy in their main lesson books. We used this opportunity to introduce grammar – naming words (nouns) and doing words (verbs) and talked about how sentences need both of these kinds of words. Next we went back to think about humans again, and specifically their work in a garden. We had talked about this the week before, so we revisited but this time we explored rhyming couplets. We put a bunch of rhyming words on the board associated with the garden and then, as a class, we came up with many rhyming sentences. Then, delightfully, we put these together to write a class poem about the garden. The children then copied the poem into their main lesson books and were able to create beautiful borders around their words. They loved the choice involved here, for everyone was allowed to create their own border within my parameters. The poem took us two days to complete main lesson book work and then we began to talk about animals again, but using rhyming words. So again we filled the chalkboard with animal rhyming words – which of itself is great for early readers to see and hear – and we began to write simple rhyming phrases such as, “The mouse scurries to his house.” Second graders got another chance to come up with their own rhyming animal sentences and write them, while the first graders copied from the board. Second grade also underlined their naming words with green and their doing words with red. On Friday we continued our discussion with animals but focused on the sounds that animals make – this is a new dimension of doing words. 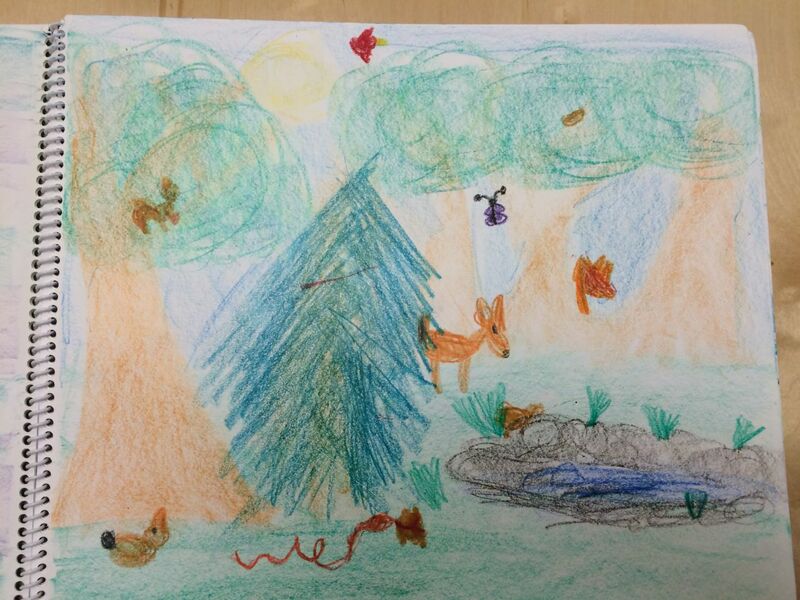 We drew a beautiful forest together with animals hiding behind rocks and trees. 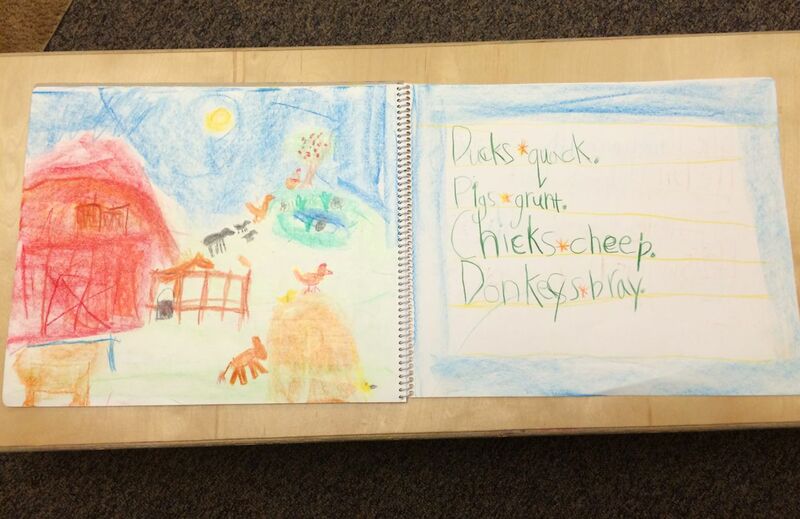 Then we wrote sentences such as, “Chickadees cheep. Bunnies squeak.” Again, second graders got to write a few sentences on their own, sounding out the words and writing on scrap paper. After I checked them, they wrote final drafts in their main lesson books. In reading time, our early readers are sounding out simple words using sh, ch, wh, ph, th. Our more advanced readers continue to read “The Secret Door” together. We painted on Wednesday complementary colors of prussian blue and vermillion. These hung on our bulletin board for a few weeks. Our third week of Fables began by reviewing our previous work and revisiting our forest animals drawing. We then began talking about barnyard animals and the noises they make, so together we drew a barnyard scene into main lesson books. 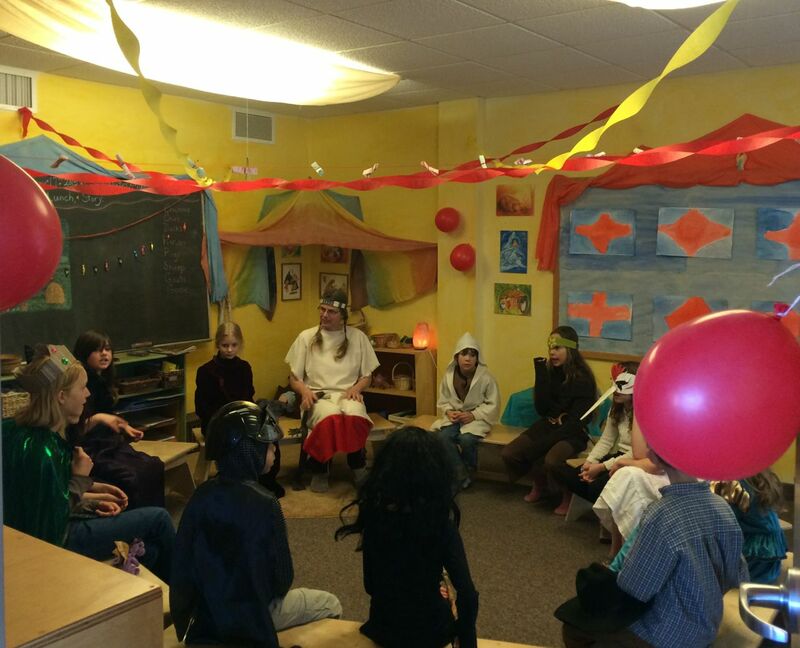 The rest of main lesson was the Fasching party – where the children got to experience many fun German games and traditions. On Wednesday we wrote sentences from the barnyard scene such as, “The horse whinneys.” We composed many sentences together, which the first graders copied into their main lesson books and then second graders got to write some sentences on their own. The entire class is needing less direction from me, and are better able to do their work on their own. This is just what I want to see. In the second part of main lesson, we reviewed many of the fables I’d told so far. Then we talked about the merits and limitations of animals in comparison to humans, and I introduced the concept of a simile. On the board, I wrote, “She _____ like a __________.” Under the first blank I wrote (action word) and under the second blank I wrote (animal). We wrote many similes. She runs like a deer. He jumps like a frog. She sings like a bird. We talked about how humans can embody almost any animal or act like an animal. They couldn’t quite see this, so I challenged them to name any animal, and I would tell them how humans could act like that animal. This was great fun – and the conversation has continued for many days. For example, a student raised their hand and said, “A worm!” and I’d say, “She wiggles like a worm.” Some of the similes portrayed behavior we weren’t very fond of such as, “He eats like a pig.” Some portrayed meritorious behavior such as, “She dances like a flamingo.” And here is where we got to the heart of our fables block, seeing human virtues and failings personified by the animal kingdom. These similes were written into main lesson books on Thursday and second graders did a great job of coming up with their own similes and writing them as well. In the second part of main lesson on Thursday we added words to our Word Wall. These are sight words that the students will need for basic reading. We played a Mind Reader game with these words in order to familiarize ourselves with the words. On Friday we looked back over all of our work in our Fables Main Lesson book, re-reading all of the sentences we wrote and talking about the lessons from each day. Then we put a beautiful title page into these books. In the second part of main lesson, we broke up into 4 stations. Each second grader took a station and led a first grader through it. One station went through letters and their sounds and some word flash cards with short vowel sounds, another station went through consonant and vowel blends and simple Bob books, and another station went through vowel sounds and word flash cards with long vowel sounds. I took a station as well and taught a new game, a word game called Boggle. This worked so well that we’re going to do it a lot more! The second graders loved teaching and the first graders remained very engaged and eager. A fun way to practice our growing phonics skills. “The Brave Lion and the Foolish Rabbit” is a tale of compassion and unnecessary fear. It is a long tale with repeating parts, only new characters that repeat the same action. After hearing short fables, this story seemed very long and all of the children were heartily engaged. In fact, sometimes our class reaches a higher plane, where we are all so engulfed in the story that it’s as if we are all living in the same image. Time stops and magic ensues, and I was right there in the midst of it with them. I encourage you to tell stories to your children at home, even if it’s simple stories of you as a child. The more stories you tell, the easier it becomes, and then all at once you come to a place where you don’t think anymore. The story just emerges and it is beautiful. Handwork is also demonstrating capacity building these days. Students are finishing projects and moving on to new projects. Clementine, Frances and Iris have learned to crochet and are working on a pencil case. Nick moved onto knitting a flute case after finishing his bunny. Charly finished his potholder and will move onto knitting a bunny. Luna finished her flute case and will move onto crocheting this week. Fourth graders continue to work on needle felting animals, using pipe cleaners inside of their creations. This is proving harder than they expected, but sticking with it is proving rewarding for them. This is a huge lesson in handwork. We, as teachers, make the students continue working on their projects. This is hard. There is often whining involved. However students press on because it is the expectation. Then they finish the project and experience the satisfaction that comes after all of that hard work. It is an important lesson that will stick with them for their entire lives! 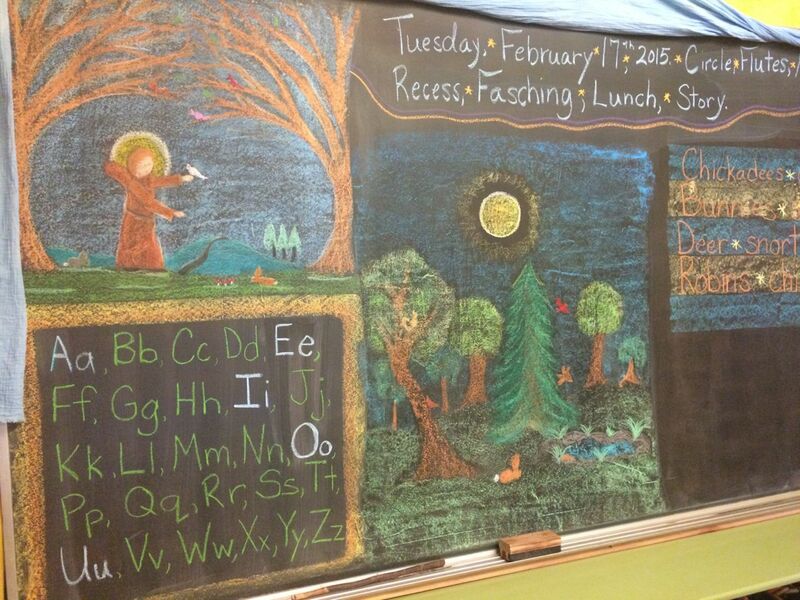 Here is a photo of our chalkboard when we drew the forest animal scene.